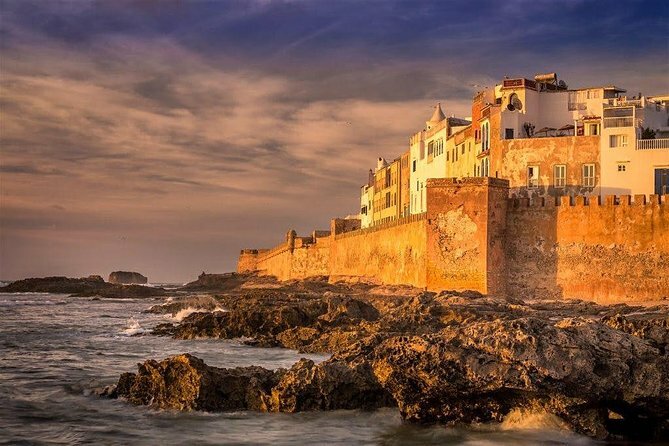 Essaouria is reminiscent of an age when Spain, Portugal and England struggled to control their coasts and is formally known as Mogador.It is home to a traditional Portuguese harbor with fine examples of Moorish and Portuguese art. Famous for its fine wood-work, Essaouria is also home to the silver souk (commercial quarter), art galleries and islands. Stroll along the historic ramparts and step back in time. Just before you arrive in Essaouria you will have the opportunity to stop and take photographs of the goats in the trees and meet the locals at a traditional Argan oil co-operative, where the famous oil is extracted from the Argan nut. Explore Essaouria’s traditional port and discover its long and interesting history, see the ramparts and the Old Town full of medieval architecture at its finest, enjoy a relaxing walk along the beach, historically famous for its fishing, and more recently as a windsurfing destination. In the medina, see Moulay El-Hassan Square, the Grand Mosque and Siaghine Alley. From the terrace of the north Bastion you can access the marquetry, where the Morocco’s best marqueteurs work on cedar. As you leave the confines of Skala, you will follow Derb Laalouj street to the Museum Sidi Mohammed Ben Abdallah. Here musical instruments, local Andalusian songs, Berber Imazighen documents, weapons, costumes, carpets, and more is displayed in the former residence of the Pasha. Located in the north of the city is the “Mellah”. This Jewish Quarter is crossed by the traditional Rue Mohammed Zerktouni. It is bordered by a market that extends to Bab Doukkala.